I was reading in the newspaper today that someone’s come up with a list of about 30 signs that you’re getting old. Things such as you find pubs too noisy, fall asleep in front of the TV, groan when you bend down and, I’m not sure about this one, you take up drinking sherry. What’s wrong with sherry? I’ve been enjoying a nice amontillado every now and then for years. In my day, women had to retire at 60 and frankly, I was glad to go. All those changes at the post office, with the new technology coming in. (And not liking new technology is another sign you’re getting old, by the way. So here I am in my retirement, and I’m really enjoying it. I live where I’ve always lived, in Llanelen, a town in North Wales. We have just about everything we need except for a bookstore and a dry cleaners. But nobody stays in the towns anymore. All the young folk leave to go away to college or uni and don’t come back. It’ll be all that clubbing you hear so much about, I expect. It’d been pretty quiet here for a long time, we kept ourselves to ourselves, and then about three or four years ago, just about the time that Canadian author who comes to visit a couple of times a year started writing her books, murders started happening. I wonder about that. Anyway, there was the posh bride who went missing on her wedding day and then that poor man in Llandudno and there’ll be more to come, I shouldn’t wonder. 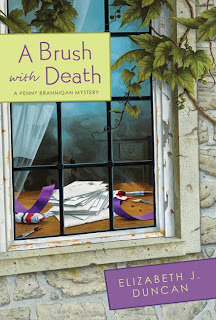 We have a Canadian character, Penny Brannigan, living here in Llanelen. She fancies herself an amateur sleuth but between you and me, I’m not sure she’s as good as she and that Elizabeth J. Duncan seem to think she is. Penny’s always busy working. First it was that manicure salon she set up and now it’s the new spa she and her friend Victoria have got going. Don’t get me wrong. I hope the spa will be a great success because it’s sure to bring more trade and custom into our town and I’m all for anything that boosts our local economy. I’m all about civic pride, me. And that’s another thing. 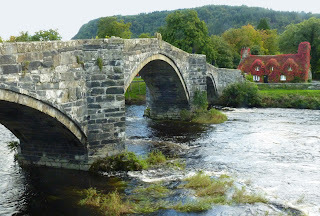 That Duncan woman calls the town Llanelen but if you really want to know, it’s Llanrwst. Oh yes, getting old. Anyway, I guess all of us experience it differently, but one of the things I hate about it is the way my hands look. So I have a standing appointment every week for a manicure with Penny and if you haven’t had a manicure yourself for a while, I highly recommend it. A little pampering goes a long way, especially as we get older. Other key indicators about getting old, by the way, include taking an afternoon nap, buying shoes and clothes for comfort rather than style, forgetting names, failing to recognize any of the songs in the Top Ten, forsaking Radio 1 for Radio 2 and that old favourite, thinking that policemen look young. Noticed anything different in your life that makes you think you're not as young as you used to be? 60 is the new 30. Just a number. You live in a beautiful place, Evelyn. I wonder about the sherry, too. Who has time to get old??? Heck, my husband has been falling asleep in front of the television since he was 40, so that doesn't count. I for one haven't known song titles since I stopped listening to WABC's Top 40 in high school. Problem is, now I don't even recognize the names of the groups singing. Hey, I've been to Conwy! Evelyn, your town is gorgeous and I have enjoyed visiting the fictional version too. I think you're right about that Canadian author though: any time she shows up, the body count rises. Be wary, but keep those nails looking fabulous. I'm 35 and I can relate to all of those things! Those people who come up w/ lists have secretaries, or interns, or gofers, or whatever who remind them of appointments and generally steer them through life. Not to say they couldn't tie their shoes w/o help, but you can bet the lists will be amended as they age. Thank you all for reading Evelyn's blog and submitting your interesting and fun comments. I am in Wales now and walked past Evelyn's house just the other day!